If you’ve looked at Windows Azure in the past, you owe it to yourself to take a fresh look at it now. Windows Azure was re-launched on June 7 with a highly-publicized Meet Windows Azure event in what you might call a coming out party. The improvements and expanded scope of the platform are amazing – truly an embarrassment of riches. In this series we’re going to review the updated platform and what the implications are. Here in Part 1, we’ll explore the new management portal. In subsequent parts we’ll examine the new and updated features individually. Those last three items are the modes in which you can now use the cloud: supremely managed, highly managed, or self-managed. Web Sites allow you to run web sites in the cloud without having to change the way you do things now, and with no cloud-specific artifacts to deal with. 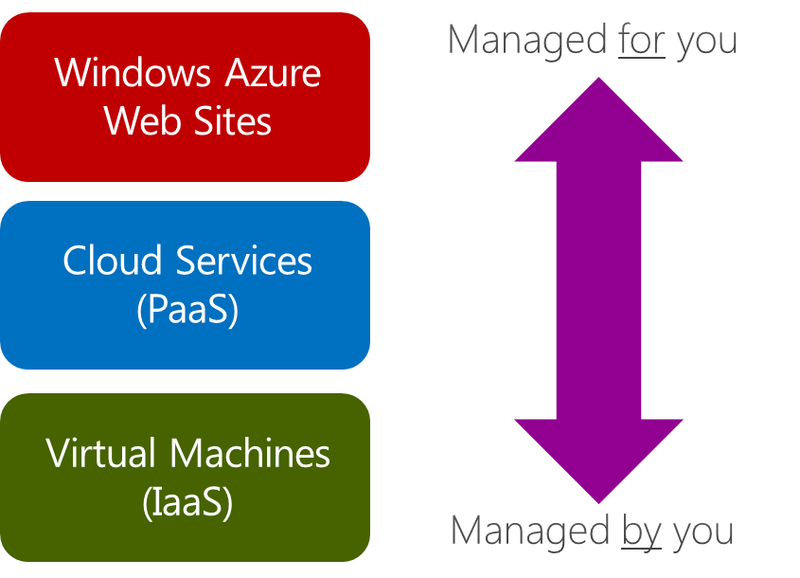 Cloud Services are the new name for the traditional Windows Azure PaaS Service Model. 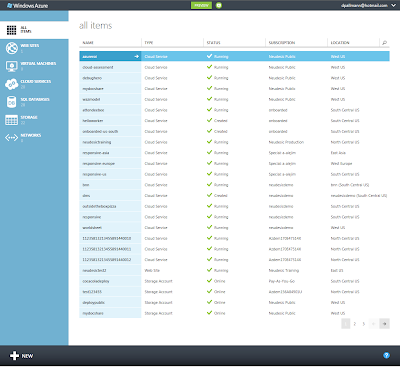 Virtual Machines provide a self-managed capability where you directly create, configure, and compose persistent VMs. We’ll go into each of these ways of using the cloud in Parts 2, 3, and 4. These three modes of use make Windows Azure the broadest cloud platform in the world, with something for everybody. Those who “just want it work” without having to do direct IT will love Windows Azure Web Sites. Those who like managing everything themselves (you know who you are) will prefer Virtual Machines. And Cloud Services, the original PaaS model, strikes a nice balance between the two: a high level of automated management with the versatility to support many different kinds of applications. 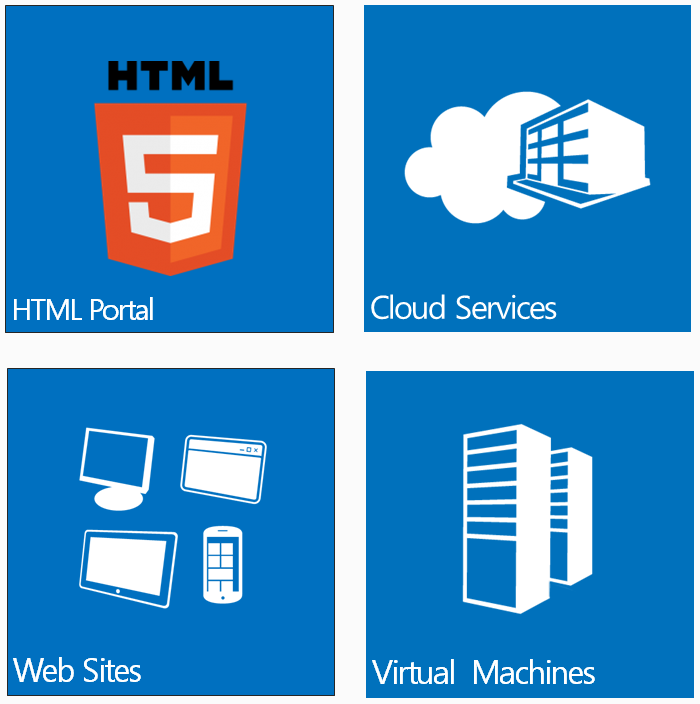 The new Windows Azure portal is HTML-based – a big departure from the prior Silverlight-based portal. This change broadens its reach, allowing it to be used on tablets such iPads or Windows 8 slates. This means you can be managing your cloud assets pretty much anywhere as long as you have connectivity. I can be on the couch or even outdoors with my iPad3 4G and monitor and manage my cloud assets when I need to. Now you can have a life and still responsibly oversee your IT. The new portal has a clean and attractive design and delivers a superior user experience. Its styling looks to have been inspired by Windows 8 Metro principles. The portal has a command bar at bottom, showing available commands, and a notifications area for status and error messages. Notifications can be hidden or expanded, and they stack. The new portal is a major improvement in usability, and it also plays an instrumental role in several of the new features such as monitoring analytics and in-cloud VM composition. In the past, if you wanted to monitor your cloud assets it was up to you to set up diagnostic monitoring in your application, usually by leveraging the Windows Azure Diagnostics system. Although this facility is very powerful, it requires you to take steps to configure it in your application and doesn’t include a way to visualize the data that is collected. In the new portal, monitoring of core metrics is automatic. Use of Windows Azure at any level (Web Sites, Cloud Services, or Virtual Machines) includes built-in monitoring and the portal nicely displays metrics as shown below. The display is interactive: you can change the time scale and which data points are displayed. This new built-in monitoring facility doesn’t do away with Windows Azure Diagnostics: WAD remains important for capturing a broad variety of metrics including event logs, performance counters, IIS logs, crash dumps, trace logs, and application logs. As useful as that is, it’s fantastic to bring alongside it built-in monitoring, something you don’t have to enable, that’s there for you when you need to know what’s going on with your cloud deployments. Windows Azure has grown up. Often newer technologies bring benefits and innovation as well as rough edges and pain points in the early days, forcing prospective users to carefully weigh the pros and cons. Cloud computing has been no exception. 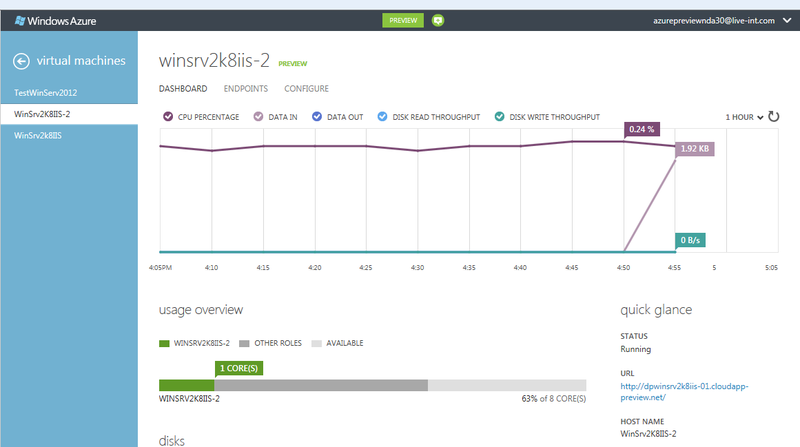 Windows Azure has reached a milestone and isn’t just for early adopters any more. I look now at Windows Azure, as compared to its debut in late 2008, and I’m supremely proud of how far it has come. 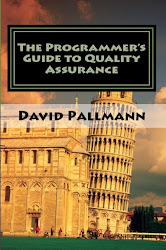 It provides significant value that nearly all organizations can benefit from; its development and management experience is excellent; its breadth of capabilities is unmatched; and its multiple modes of use accommodate, rather than frustrate, a variety of IT preferences. Sound too good to be true? 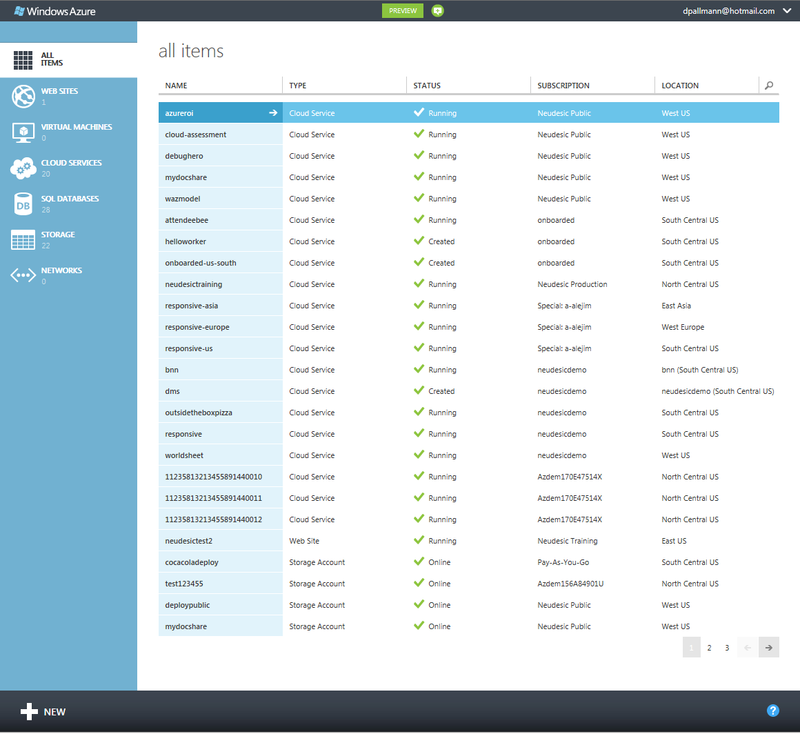 Don’t take my word for it - do yourself a favor and check out the new Windows Azure at http://azure.com and take advantage of the free 90-day trial. You’ll be glad you did! . . hmm I still get the old portal. The prominent Portal link on azure.com currently still takes you to the old portal, but there are other management links on the site that link to the new portal. Or, just navigate to http://manage.windowsazure.com directly in your browser. thanks for that.. do you know when they will move the SQL Portal to HTML 5 too? yes - the new portal is the cleanest, most functional design I've seen for that type of UI. So, I want to use it - where can I find the templates/ stylesheets ?